New Interim Superintedent Eddie Johnson said he plans to apply for the CPD superintendent job when the application process begins again. CHICAGO (WLS) -- Eddie Johnson, a 27-year Chicago police veteran who was appointed Monday to lead the embattled Chicago Police Department, said he plans to focus on reducing gun violence and restoring public trust. "It's a huge challenge, but we can get there," said Johnson after Mayor Rahm Emanuel officially announced during a press conference that he would take over as CPD's new interim superintendent. The announcement comes about a week after the Chicago Police Board sent Emanuel three recommendations to fill the job. Emanuel rebuffed the recommendations, indicating he favors Johnson -- who never applied -- to fill the post permanently. "I am confident Eddie Johnson will hit the ground running," Emanuel said. "He is already on the job, he knows our police department, he knows our city." On Monday, Johnson stood among the command staff, including two senior colleagues who were passed over for the job. Johnson is now charged with leading a department that is not only low on morale and credibility, but also has failed to quell a recent spike in gun violence. "I would say to these young people out here shooting and killing, they are destroying our communities, they're destroying families and it has to stop," Johnson said. A native Chicagoan, Johnson started at CPD as a beat cop and worked his way up the ranks. He was previously chief of patrol. "I am one of you. I grew up here. I raised my kids here," said Johnson, adding, "I have spent my entire career with the Chicago Police Department. I am proud to wear this star, and I am absolutely confident that we can meet this challenge." U.S. Rep. Bobby Rush, D-Chicago, called Johnson a "fine man" who knows the people and communities he serves. "He knows this stuff," Rush said Monday. "He knows it from the bottom up. This isn't theory with him. He knows it. He knows where the youngsters who are at risk, who are in trouble or causing trouble. He knows where they live, who they go with, who their mamas are, who their daddies are." 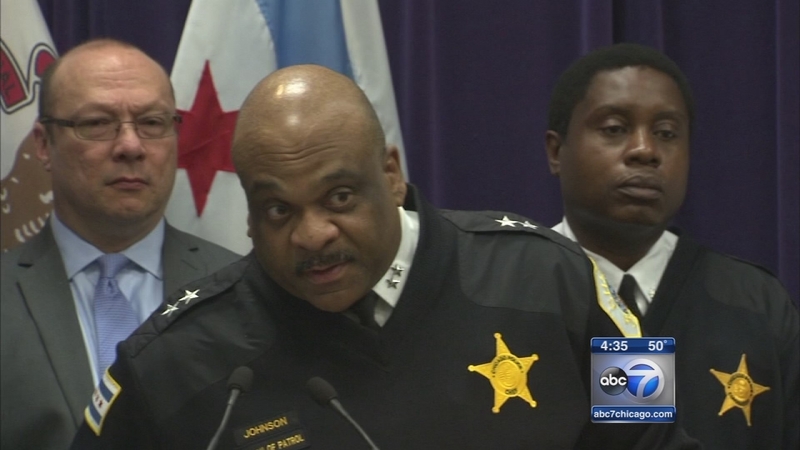 Eddie Johnson has taken over as the Chicago Police Department's new interim superintendent. We look as his 27-year career with the department. VIDEO: WHO IS EDDIE JOHNSON? Johnson has patrolled some of the most dangerous streets of Chicago, and has a strong record on fighting crime in what's known as Area Central. "I patrolled the neighborhoods at every hour of the day and night for 27 years. I know that trust won't be restored overnight. It has to be earned every day in both routine as well as high-pressure situations," Johnson said. He grew up in the now-demolished Cabrini Green until the age of 9 when his family moved to the Washington Heights neighborhood, where he still lives. CPD's News Affairs said his favorite hobby is being a grandfather. Johnson is well-known and well-liked by the CPD rank-and-file. He has a strong track record of fighting crime as deputy chief of patrol. According to the Chicago Tribune, Johnson is remembered for his work after Officer Thomas Wortham was fatally shot during an attempted robbery outside his parents' Chatham home in 2010. The Gresham police district began hosting an annual anti-violence event at the park across the street where the slain officer once mentored youths. Children and their families set up tents and spent the night as part of the event. And Johnson camped out with them. Johnson would be the first CPD top cop chosen from inside the department since 2003, when then-Mayor Richard Daley tapped Philip Cline to be his superintendent. McCarthy had promoted Johnson to be deputy chief of patrol and was promoted to chief of patrol when McCarthy was fired in December. The high-ranking chief of patrol position oversees patrols in all of the department's 22 districts. Dean Angelo, of the Chicago Fraternal Order of Police, said the union looks forward to working with a superintendent promoted from within the department. "It hasn't been this way for the last two superintendents so we're happy to see that it's a person who is homegrown." The appointment as interim superintendent replaces John Escalante, who took over when the mayor fired Garry McCarthy for his handling of the Laquan McDonald shooting. The process to make Johnson permanent has yet to begin. 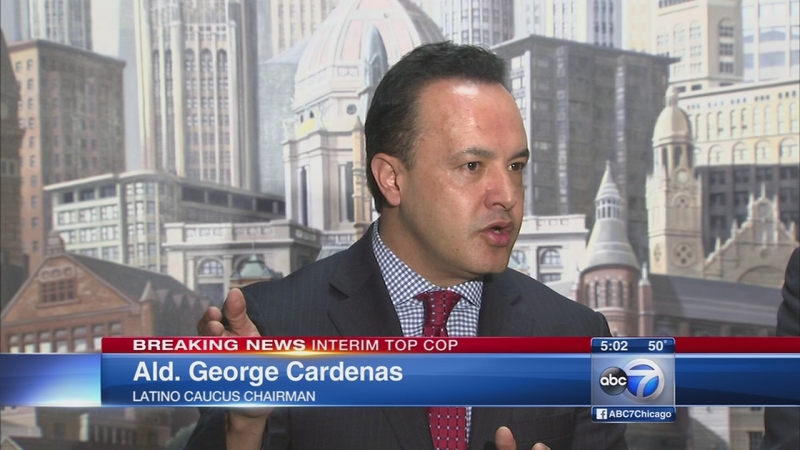 Escalante was not among the three finalists recommended by the Chicago Police Board. A total of 39 people did submit applications. Emanuel said he has asked the police board to reopen the search, adding "I've asked Eddie to apply this time." Johnson said he did not initially apply because he knew Escalante was vying for the post, however, said Monday: "I am going to apply if the search is re-opened." On Monday, Escalante said he wasn't sure if he would apply again. Emanuel said he has spent the past three and a half months talking to people in Chicago, including police officers, about the type of leader the department needs right now. He said that the police board's recommendations were all good candidates, including another CPD veteran, Eugene Williams. However, ultimately, Emanuel said he believes Johnson is the best person for the job. "The mayor has always been very clear that it's going to be his decision. He is, really, all about control. So he wanted to completely control this process, and he's taking the process away from the board," said Laura Washington, ABC7 political analyst. Community leaders and alderman reacted Monday to the announcement that Mayor Rahm Emanuel tapped Chicago Police Department insider Eddie Johnson as interim superintendent, indicating that he wants the 27-year CPD veteran to be appointed to the position permanently. While leaders of the City Council's black and Latino caucuses expressed frustration that they were not part of the selection process, they have said they support Emanuel's decision. "In the chiefs, there are no Hispanics. In the deputy chiefs, there are only two Hispanics. One female, one male. Out of 17. I think we need to address those inequities. I think we need to address the diversity and lack of diversity for Hispanics. So we're putting all of our faith in the process of the selection of the superintendent and supporting Eddie Johnson," said Ald. George Cardenas (12th Ward), who is chair of the Latino Caucus. While many say positive things about Johnson, others believe the mayor should have respected the process and chosen one the police board's three candidates. Even though retired CPD Officer Richard Wooten worked with Johnson, he believes the mayor's process was wrong. "Eddie is a great boss, a people person," said Wooten, of the Gathering Point Community Council. "He's one who can get the job done, but it's not about Eddie. The mayor has flip-flopped." Some Englewood residents bristled at the decision. "Picking it from within the police department is fine, but it should have support from everyone involved, not just the mayor's choice," said resident Shirley Mitchell. U.S. Rep. Danny Davis (D-Chicago) pointed out that his office is located in the same district where Johnson was a commander and have frequently worked together. Police politics aside, others in an Englewood laundromat on Monday said they want a police superintendent who they can trust to make their neighborhood safer. "We need somebody inside the black community who knows what is going on inside the black community," said resident Chris Thomas. Retired Deputy Chief Bruce Rottner said Johnson will bring experience and knowledge to a department still reeling from controversies like McDonald's shooting death. Jason Van Dyke is charged in the teen's murder. Dashcam video shows he shot the teen 16 times in 2014. "I think it was a great choice. I think Eddie will be just a magnificent superintendent. I really do," Rottner said. However, Brandon Smith, the independent journalist who successful fought to get the McDonald video publicly released, said the next top cop must be someone who holds officers accountable when accused of police misconduct. Smith said Johnson played a big role in the crackdown of NATO protesters a few years ago. "I don't know that Mr. Johnson has demonstrated a very dedicated mindset for reform of the police," Smith said.